WordPress is one of the most popular content management systems (CMS) out there. It’s user-friendly, and the customization options are extensive. This allows any type of business to create any type of site that they’d like. When it comes to ecommerce, though, WordPress’s user-friendliness isn’t enough to get the job done on its own. Actual ecommerce solutions are needed in order to enable you to create products, process orders, and manage your online store through your WordPress site. These come in the form of WordPress plugins, and in this post, we’re going to look at the best WordPress ecommerce plugins to help you build your site in 2018. WooCommerce is easily the most popular ecommerce plugin for WordPress and it’s what I recommend my clients use if they don’t want an all-in-one solution like Shopify. Let’s take a look at some of the tool’s biggest pros and cons. The fact that it’s so popular means that there’s a lot of resources available to you. This includes more themes that are compatible with it and an enormous number of extensions available to enhance the functionality of your store. While you may have to pay for some themes, the large selection is always good. It’s flexible in letting you choose what to sell. You can sell your own physical or digital products and you can also act as an affiliate and sell external products. There are multiple great payment options. Payment flexibility means that more customers will be willing to purchase, especially with tools like PayPal added on. Complete inventory management is available. You can keep track of your entire store through this interface. There aren’t a lot of cons when it comes to WooCommerce. The only one to watch out for is the themes. While plenty of themes technically work with WooCommerce, they aren’t all created equal, and some may not look so great when the plugin is used. Look for specific WooCommerce compatibility when choosing your theme. You may be most familiar with Shopify as its own, standalone all-in-one ecommerce platform. 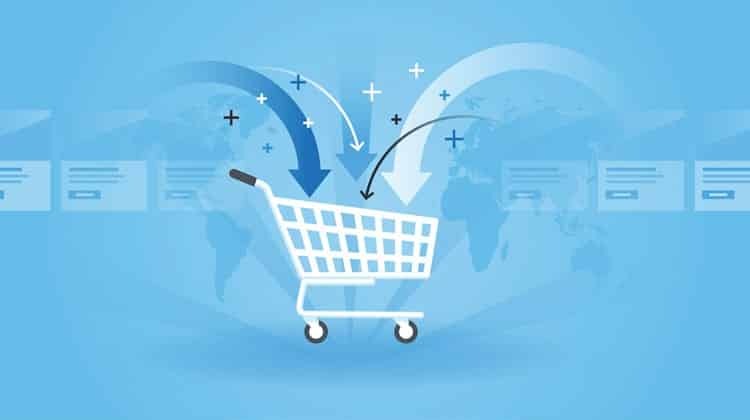 Their WordPress ecommerce plugin lets you add a Shopify shopping cart to your WordPress site, which connects back to your Shopify subscription for total inventory management. It’s exceptionally user-friendly. There is no ecommerce tool out there in the world more beginner-friendly than Shopify. It’s easy to not only create but manage your online storefront through this solution. And, since it’s all-in-one, they take care of things like site security and monitoring uptime for you. There’s support for both digital and physical goods. As you’ll see in just a minute, that isn’t true of all the tools on this list, so it’s an advantage. You can manage your entire inventory. The inventory management system of Shopify is a huge plus, and it’s relatively automated. It works with omni-channel selling. You can sell directly on Instagram, Facebook Shops and Pinterest’s Buyable Pins when you have Shopify and it will all be tracked in your store. It may be unnecessary. Shopify itself isn’t limited to product pages—you can create entire sites from scratch quickly and easily. It would likely make more sense to just host your entire site through Shopify, and skip WordPress all together. You still have to pay for it, after all. You have to pay up. Shopify plans start at $29 per month and there are transaction fees that are determined based on your current plan. This will cost you extra. If you didn’t guess from its name, Easy Digital Downloads is all about digital downloads. If your WordPress ecommerce store sells (or ever will sell) physical products or goods, skip this one and move ahead to the next plugin. Still interested? Let’s take a look at the big considerations surrounding this WordPress ecommerce solution. The interface is incredibly user-friendly. It’s easy to learn and easy to use moving forward and there isn’t really a learning curve involved. It’s specialized. The fact that it’s designed solely to sell digital goods means that this plugin is really good at what it does. The customer and store manager experience is good. There’s great support. There’s a lot of great support for this plugin, both from the developers and the community as a whole, so if you need help you’ll be able to find it. Theme-friendly. There are themes built to be compatible with this plugin, but it works well with almost all themes, especially more modern ones. This is a big advantage. Extensions available. There are plenty of great extensions available, including ones that help with shipping and/or add more payment options to your store. There aren’t a lot of cons to this one either except the obvious: you can only sell digital downloads here. And, specifically, you can only sell your own digital downloads in your store (unless you install a third-party add on that lets you sell from external sources). Even if you only do digital now, that may shift in the future, so keep that in mind. MemberPress advertises themselves as the “All-in-One Membership Plugin for WordPress.” Subscription-based businesses, this is a good one for you. This software is designed to specifically help you run your online subscription business, including tracking orders and selling both digital and physical products. This includes pay-per-view content, too. It’s subscription-friendly. That’s an understatement, but it’s important, because many ecommerce solutions aren’t well equipped to handle subscription-based businesses. Having a tool that focuses exclusively on that is a benefit if it’s what you’re looking for. Strong integrations are available. You can even integrate MemberPress directly with WooCommerce. This could work well for businesses who want to sell some subscriptions alongside a-la-cart products. (If you need an example of how this would work, GlobeIn is an excellent example). And, since the integration is available, you don’t have to choose one focus in your business over another. The biggest con here is that MemberPress’s payment options aren’t great. They have Stripe and PayPal, which are the big ones, but they’re also missing other options that users may prefer instead. Which WordPress Ecommerce Plugin is Right For Me? When you’re trying to choose which WordPress ecommerce plugin is right for you, look at what your business needs right now and what you’ll expect it to need in the future. Most businesses, after all, have the hopes to scale eventually, so you want a plugin that will give you the capability (and the features) needed to do that when you’re ready. You’ll also want to make sure that your site’s chosen theme is compatible with the plugin of your choice—especially if you have your heart set on one or if your site has already been designed—and that it has enough extensions to match your business’s needs. What do you think? Which of these WordPress ecommerce plugins would you choose? Would you choose WordPress at all to run your online store? Share your thoughts and questions in the comments below! Wonderful job Ana! Thanks for sharing.